This may come as a surprise to many of you, but despite the fact that I have a small child, I didn’t eat dinner with him on a regular basis until just recently. I used to prep a meal and feed him, then wait until my husband was home much later and eat with him. This allowed us to sit at the table and catch up on the day in peace, and was likely also a habitual carryover from my kiddo’s baby days. As summer this year came to a close and my little man was about to start SK, I felt it was time to make a change. Before you start gasping and clutching your chest, please wipe away images of him eating alone at a table with only the sound of chirping crickets for company. If I wasn’t sitting at the table with him, I was definitely within his sightline and earshot in the kitchen doing things. Still, something had to give. I’d noticed on the occasions that my kiddo and I did eat dinner together (hubby out of town, etc. ), that he had A LOT to say over dinner. Like, way more information about his day than I can usually pry out of him. Also, he and I spent 2 weeks in Finland in August with my Dad hanging out with our family and just generally being together and ate dinner family style every single night. I think that was the tipping point for me. It was difficult to come back from that amazing trip, and not want to sit with him at night and hear his stories. With 2 weeks to go before school started I shifted my cooking and eating habits and haven’t looked back. Now, if you don’t currently eat dinner with your kids every night, please don’t think that you’re doing something wrong. Every family needs to do things in a way that works for them. Obviously, for over 4 years, not eating dinner family-style more than once or twice per week worked for us! I can think of a number of reasons why feeding your kids and then yourself (and maybe your partner) later might work better, and getting to have a peaceful meal is only one of them. This resurrection of the family dinner has come a whole new level of both meal planning, and getting creative in the kitchen. My child isn’t a super picky eater, but he’s also not terribly adventurous with new things or fond of meals that appear to contain too many vegetables at once (my fave!!). I’m not, however, of the mindset that cooking a family meal that everyone will eat should mean that I have to make too many compromises either. So, how do I make a family meal that makes everyone happy (for the most part)? Always include one element that I know will be a hit with the kid. I never make an entire meal filled with things that he either dislikes or are unfamiliar. It’s not that I don’t want him to branch out and try new things, it’s just that it’s easier to accomplish that if we aren’t fighting about everything on his plate. Make a meal that includes options. For me, that might look like reducing or eliminating the grain, or adding extra veg (some nights this is just fresh pea shoot sprouts snipped on top!). Some nights I make my kiddo mashed potatoes and cut up veggies as a side dish instead of whatever I’m doing because I know he will eat it and it’s easy to do. Get him involved and make it a party! Vietnamese fresh rolls and tacos are my best examples for “party style” eating that gets him involved. He can pick and choose his ingredients and put it together himself (with a little help). By giving him a little extra control I’ve watched him try out a few new things with no pressure from me. Also, a wide variety of options means that we are both happy! I can load up on veg (and even skip the tortilla for a collard or chard leaf! ), he can choose what appeals to him, and we are both happy eating the same meal. My weekday emphasis has always been on simplicity, and despite trying to create meals with flexible options my emphasis remains the same. Simplicity to me means uncomplicated ingredients, relatively quick cooking time, and often just trying to use what I have on hand. Mondays are the last day before I get my Front Door Organics delivery, so my fridge is often filled with an odd assortment of ingredients. It’s usually when I opt to make a frittata, or something in line with the “Meatless Monday” theme, and always involves trying to use up things that are still hanging around. 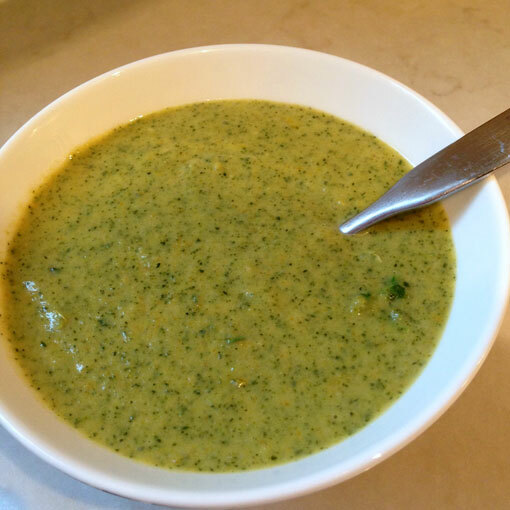 This “creamy” broccoli and swiss chard soup is chock full of vegetables and green goodness, and was a hit with both the kiddo and me! It's dairy-free if you omit the goat cheese, though many people tolerate goat and sheep dairy much better than cow. Don’t get too worried about how uniformly your veg is chopped as you’re going to blitz it all in your blender at the end. *Note: cashew cream requires soaking cashews for minimum 3hrs, plan ahead! -Soak 1 cup raw cashews for at least 3 hrs, or overnight. Drain and rinse. -Add 4 cups of water to a blender, then add drained cashews. Step 1 – Heat oil in large pot over medium heat. Add carrots, celery, onion and garlic and cook, with lid on but slightly askew, until onions are translucent ad carrots are tender but holding their shape. 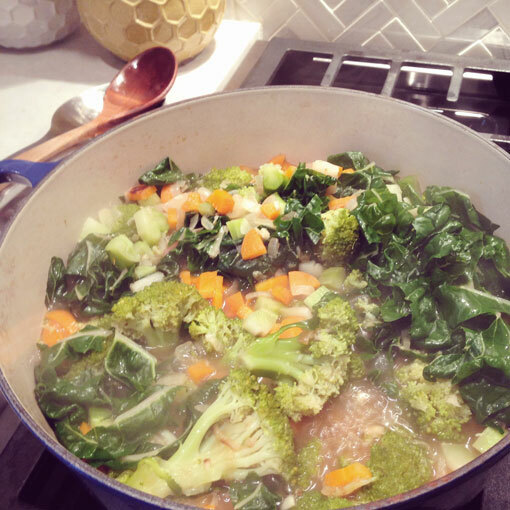 Step 2 – Add broccoli, chicken stock, thyme and sage. Bring to a boil, then reduce and simmer gently until broccoli is tender. Step 3 – Remove from heat and puree using either handheld immersion blender, or in batches using a regular blender. Step 4 – Return to low heat and stir in cashew cream, lemon juice, and chili peppers (if using). Taste, and season with a bit of salt of your stock did not contain any. Serve and top with a small amount of goat cheese. This soup freezes well, so put aside the extras for an easy dinner on another busy night.